A popular cafe and plant shop are set to become the first commercial tenant in the West Village development directly east of the Jones Assembly and add a general store. About two years ago, Okay Yeah Co. added their unique cafe to the Plant Shoppe which had been operation in the Paramount Building on Film Row for 3 years at the time. Owned by husband and wife team Chad Grubbs and Jen Semmler-Grubbs, the two businesses will be making the move to an expanded 3,600 square feet in West Village's Building D, which will be the first to open in the 5-building complex. 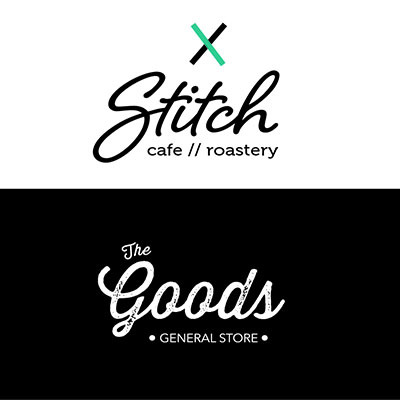 Rebranded Stitch Cafe, Grubbs told OKCTalk that is would be very different than their current operation, offering breakfast, lunch and dinner open early 7 days a week and staying open to 11 every nice, later on Friday and Saturday. Grubbs described the entire operation as community-minded with a high priority placed on bringing like-minded people together where they can connect through conversation. The food will focus on quality ingredients prepared with creativity. Stich will make their own bagels in-house and offer a juice bar, coffee and a full menu at mid-range prices. Stitch will also serve hand-selected beers, a variety of wines and a mix of specialty and basic cocktails. The Plant Shoppe will occupy the west end of the space and take advantage of a key corner and high ceilings to beautifully display the botanitc offerings. They will also be open 7 days a week. Between the plant store and Stitch will be The Goods, a small general store selling beer, wine, sundries and to-go food items that will cater to the local residents. 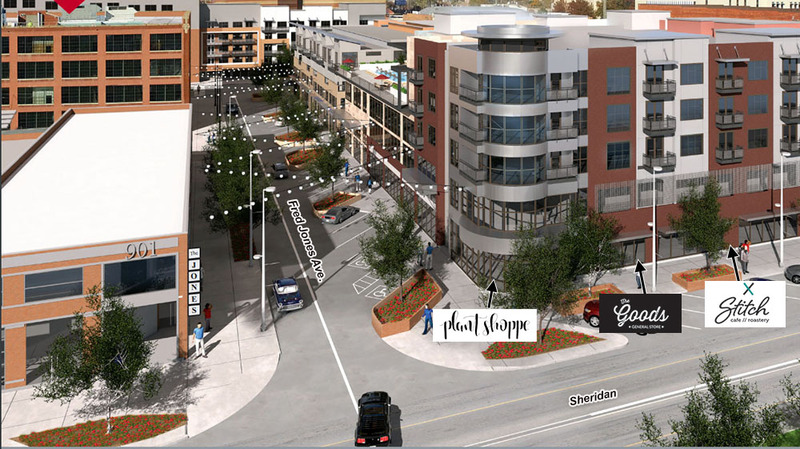 An integrated parking structure in the multi-story building will be available for customers in addition to angled street parking along Sheridan and Fred Jones Avenue which is being completely rebuilt and will soon reopen. 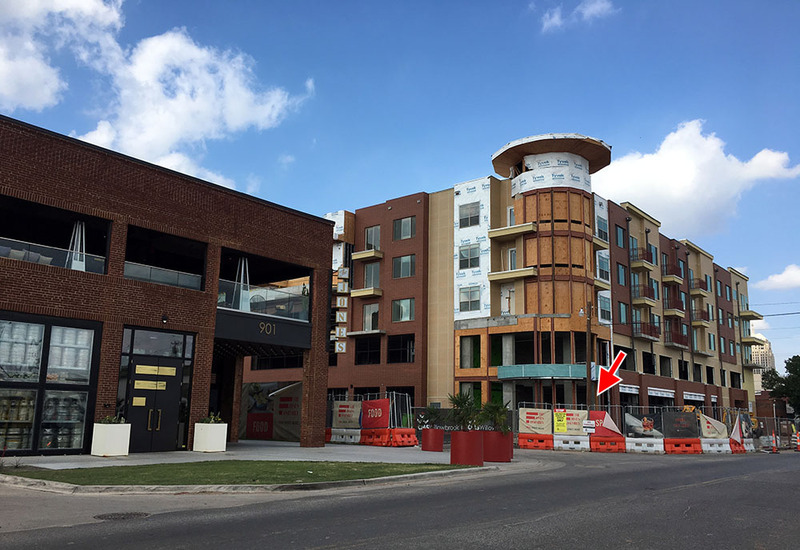 The new West Village businesses will open this fall in conjunction with the move-in of the first apartment tenants in the building above. 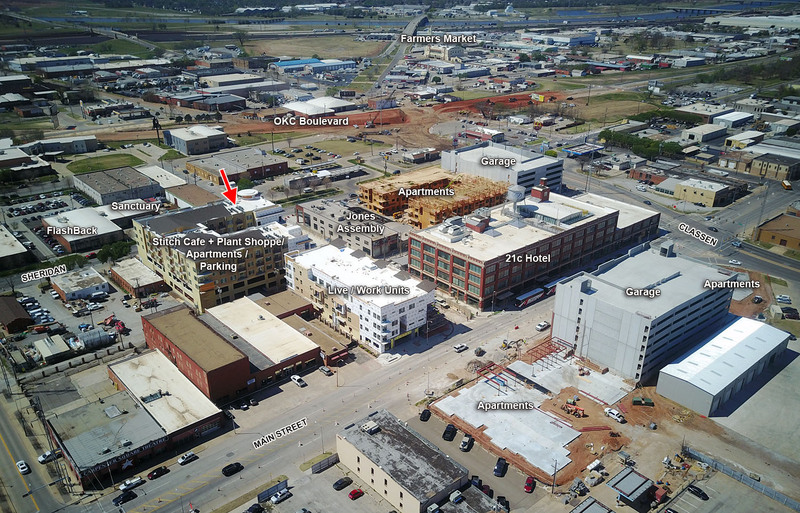 Stitch will also be offering a smaller location within The Bridge church in Bricktown, offering quality coffee, in-house baked goods and a variety of sandwiches. The model will be very similar to what is now offered at Okay Yeah Co., with a July opening currently planned. Their current locations will shut down on September 30th at the end of their lease with the Paramount. Concept and design are by Chad Grubbs and Jen Semmler-Grubbs, rendering and desing by Idea Collective, Architect is Arrive and contractor is CMS Willowbrook.